I can’t believe we’re already halfway through August. This summer has seriously flown by! We had a wonderful summer vacation and now we’re getting ready for school. I hope you enjoyed the warm weather and had a great summer as well! 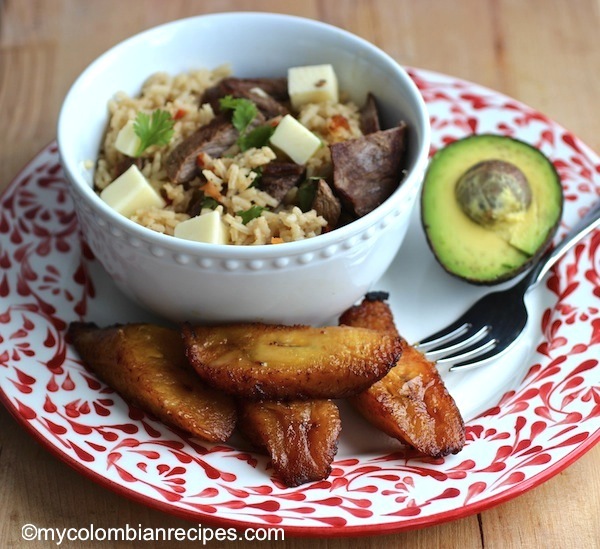 Today, I want to introduce to you another Colombian recipe from the department of El Chocó, located in the Pacific region of the country and the only department bordering both the Pacific and the Atlantic Oceans. 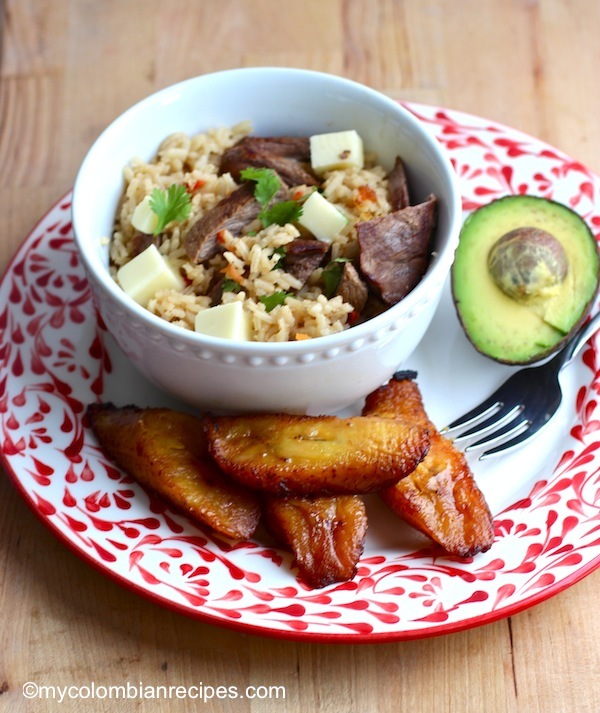 Arroz Atollado con Carne Ahumada is made with a combination of rice, onions, tomato, smoked beef, dried beef, spices and cheese, and served with ripe plantains and avocado on the side. I just love it! 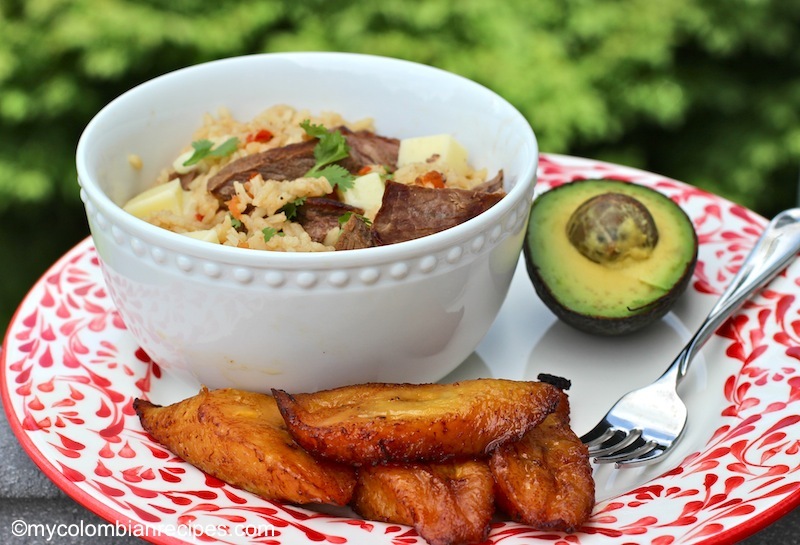 A simple rice dish with a lot of tradition, and of course, lots of Colombian flavor. 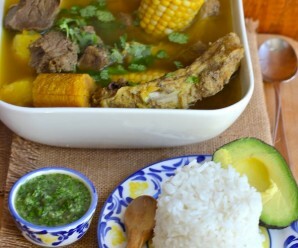 We have different variations of arroz atollado in Colombia. Some of them are Atollado de Cangrejo (crab rice), Atollado de Pato (duck rice), Atollado de Pollo y Chorizo (chicken and chorizo rice) Atollado del Valle (pork rice) and this Atollado con Carne Ahumada (rice with smoked Beef) recipe. Wash the dried beef in cold water and leave it soaking for about 10 minutes. Place the meat in a medium pot with 4 cups of water and cook for about 20 minutes over medium heat. Meanwhile heat the oil in a small saucepan, add the onions, scallions and tomatoes. Cook for about 5 minutes or until soft. Add salt and pepper to your taste and set aside. Add the rice, cumin and achiote to the onion mixture and stir well. Add the cooked beef and beef broth. Cover and let simmer over low heat for about 25 minutes until the liquid is gone. Remove from the heat, add the cheese, stir again and cover the pan. Let it rest for about 10 minutes. The rice bowl looks very inviting! 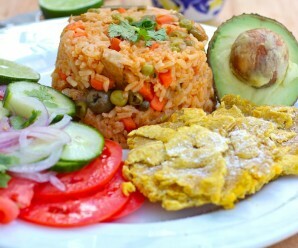 Este arroz debe quedar exquisito con esa variedad de ingrdientes. Gracias por comprtirlo! For me, this looks too dry and lifeless. The Atollado de Pollo y Chorizo has more life and looks more promising. 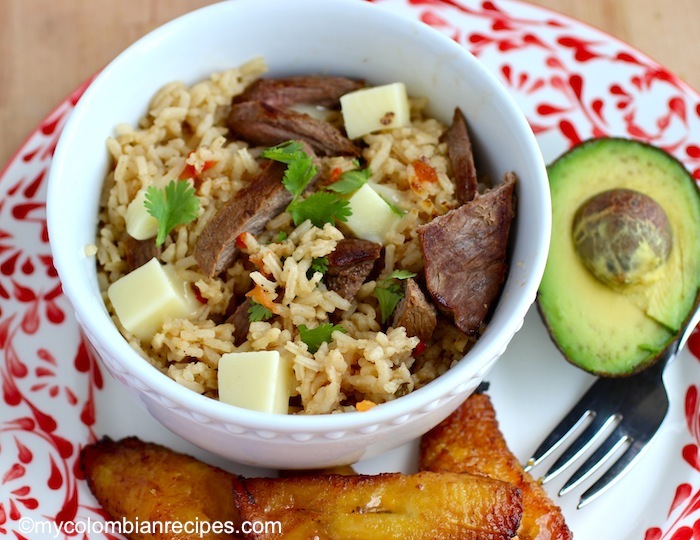 Hi Alan, I agree with you, but this arroz atollado is very good! The recipes are very different. It is back to school tomorrow here! Your dish looks delicious. Like all your dishes I would enjoy this one too. 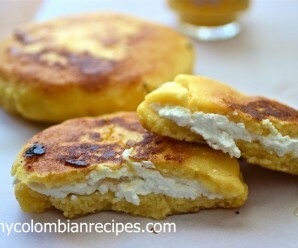 Thank you so much for your recipes and sharing the Colombian culture! My husband (American) has been cooking your recipes and sharing them with family members. 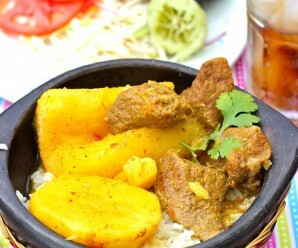 Very hearty yet still summery dish, I best the flavor of the beef is wonderful. I know where is August?